Today I passed the 32-week mark! I'm still feeling good and the babies still have good heart beats. My friend Lauren came by today with Star Pizza, which probably made my belly look a little bloated:) She cheered me up with a tiara with flashing lights. This morning we visited the level 2 and level 3 NICU (neonatal intensive care unit). It was all a bit overwhelming for me, but Chris did fine. Seeing those little babies hooked up to monitors and tubes everywhere made me feel weak; I felt like I was about to faint and probably would have if I were standing. Thank goodness Chris was wheeling me around and knows me well enough to not let stand in those situations. I know that God will give me the strength and courage to overcome that anxiety when our little ones are in there. Those who wait for the Lord - they will soar on the wings of eagles. They will run and not get weary; they will walk and not faint (Isaiah 40:31). Mari you are so beautiful! I love to see your photos and check daily. I am home from Seattle for a week or so and wanted to come visit you over the weekend but as luck would have it, I got a cold. So I am waiting til I know I am germ-free again (darn teh luck!). You are doing a wonderful job! 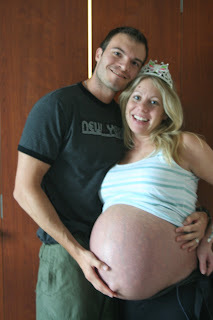 I too had a pretty much uneventful quad pregnancy. The babies will be home soon! Join some other HOM families at www.MOSTonline.org. Great info and support. It's almost time! I'm so excited to meet the babies, as I know you are too! You are going to be a great Mommy and Daddy. I'm thinking of you every day, and you are in my prayers. Love you, see you soon! Those belly shots look ohhhhhhhhhhh so familiar. Ouch. Body parts everywhere. You look like you are handling it with grace, though! Be bold and couragious, Our God is with you! Ok, I just spent 15 minutes writing a very heartfelt congrats and good luck and my comment vanished into thin air. So, to make a long story short, I've been thinking of you and praying for you for a LONG time and feel quite sheepish that I haven't been in better contact. I'm so excited for both of you and I have many others praying for you too. Can't wait to hear how everything goes for you tomorrow. You are such an inspiriation! And Chris, you are a good man! I can't wait to see you all together as a family, finally! I'm so excited for you guys! We are so proud of y'all! Just remember we're here to support y'all in any way we can. Love ya.